Alma Jo Wrigley, age 90, passed away peacefully with her family at her side on Thursday, July 20, 2017. She was born on October 12, 1926 to Daniel & Sarah Cherry Garretson in Colony, OK. After the passing of their mother, Alma & her siblings were placed in an orphanage in Tipton, Oklahoma. She was then adopted by Homer and Velma Shotts at age 4. She grew up and graduated in Tipton. Alma married Joe Wrigley on November 7 in 1944. She was the perfect example of a Christian, wife, mother & homemaker. She enjoyed cooking, crafts, swimming & collecting antique clocks. Alma is preceded in death by her parents, Homer and Velma; her husband, Joe, & son, Mike; and her siblings; Marguerite, Glenna, Myrel & John. She is survived by her sons, Joe Jr & his wife Terri and Pat & his wife Kathi; her daughter in laws, Sharon, and Elaine; her grandchildren, Scott & his wife Wendy, Robert & his wife Melissa, Chris, Melissa & her husband Steven, Michelle, and Amanda; her great grandchildren, Nichole, Brianna, Ashtyn, Morgan, Rylan, Briley, Jared, Trenton, and Harper. 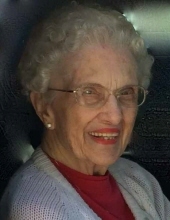 Her love of Jesus was evident in the way she lived her life and loved her family. She was a long time member of North Fork Baptist Church and she leaves a legacy of believers behind. A memorial service is scheduled on July 25, 2017 at 10:00 am at Groves-McNeil Funeral Service in Piedmont, OK. Online condolences can be made at www.grovesmcneilfuneral.com. To send flowers or a remembrance gift to the family of Alma Jo Wrigley, please visit our Tribute Store. "Email Address" would like to share the life celebration of Alma Jo Wrigley. Click on the "link" to go to share a favorite memory or leave a condolence message for the family.